I just recently heard about the “book marketing extravaganza” Judith Briles is holding in Colorado this year as part of her Author U training program for authors who want to publish. Judith is an experienced and very successful author, book marketer and book shepherd, so she really knows what she’s talking about. When I looked at the program I thought it would be well worthwhile letting you know about this opportunity. Just the four-and-a-half hour session with John Kremer would likely be worth the fee and the flight to Colorado. John is an amazing source of information on book marketing, and there will be a full lineup of other experts, too. Judith has also graciously offered a special discount to the event for readers of The Book Designer. See the end of the article for the coupon code. I think this event is an outstanding value so I invited Judith to give us her take on what authors should be thinking about in terms of the one thing everyone wants to know about—book marketing. Here’s her response. Ahhh, contraire … if anything this is when the author’s support/energy/creativity/WORK really must go into high gear. How are you feeling about the sales of your books? Have you realized that writing your book is only the beginning of an amazing journey? How would you describe your book marketing efforts? Have you created a marketing game plan to not only launch your book … but to keep it going? The support for the book, your book—whether it’s an eBook, pBook, aBook, vBook … whatever type of Book it is—is HUGE at this point. What you do, and don’t do, will either soar your sales or fail to create even a hiccup. Here’s one of the secrets of a successful author: Five percent of the author’s time goes into the creation of the masterpiece—the remaining 95 percent will go into marketing and support of it over a period of time. Ninety-five percent! Your book journey is similar to an iceberg—your completed and published book is just the tip of it … it’s all the marketing effort under the surface that needs to be created, implemented and supported that leads to success. It’s what successful authors know … and what naïve and newbie authors need to know. The 95 percent factor. Your book, and the support of it, is a long-term investment. It will take your time, your energy, your creativity, your commitment … and yes, some money. Sometimes lots of money, depending on your marketing game plan; sometimes minimal moneys, yet lots of time. Hello Internet! Your plan and platform will be the driver. What kind of marketing will your plan drive? do nothing marketing, etc., etc., etc. When your book births, marketing immediately goes into play—including the “Do Nothing” marketing campaign. You’ve made a choice—to sit on your tush—you are too pooped to market, you are in the middle of a business or personal crisis, you have no moneys for it or just don’t care. I have several hats I wear. One as an author of 30 books; one as The Book Shepherd; one as a president and executive director of Author U, a member association for authors; and one as a publisher. Last week, I contacted three separate authors that I had shepherded and agreed to co-publish their books about their lack of sales. Both my book shepherd and publisher hats were on. Publishers don’t love the term, “lack of sales.” None of these authors should have got the “Wake up and smell the book roses … possible death toll bell” from me. And they failed. Miserably. Two of them have done zip in marketing support for their books. ZIP. The third did an announcement on her Facebook page and has created a few speaking engagements. Granted, those sold books at the event, which is a great strategy and was part of the game plan. But, that’s it. Authors have got to deal with their egos—they are always part of the formula. Do they want their books available in book stores, or at least available, so that a book store can easily order it? So buyers can buy the book? So that they can tell their friends that it’s at the book store? So that they can actively tell people to buy the book at a book store, or at least go to Amazon to buy the book? Or, is it a stroke to their ego—a badge of honor to have their book in the store that they can brag about? If authors are not going to drive book buyers to book stores … they don’t need a distributor. Distributors make money when books are sold through book stores and libraries. If authors aren’t going to encourage buyers to go to stores, to Amazon, to B&N, to libraries (yes, if libraries get demand, they buy books for inventory), there is no need for representation via a distributor. Can those three authors change the limp direction of their book—even when it’s been out for a while? Absolutely! It will take some time. It will need a marketing re-direct. It will take a commitment. Will they do it? Only time will tell. Would you like to create an amazing marketing game plan? You can by coming to the Mile High City of Denver, Colorado. 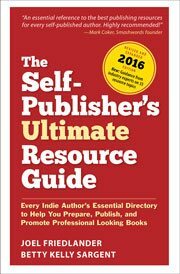 An amazing line-up of publishing marketing pros will be there at the Author U Extravaganza May 3-5 … for less than $400, you get over $50,000 in talent brought to your book doorstep. Plus, get fed. The Early Bird discount ends this Sunday, March 31st. Author U’s theme this year is It Takes a Village to Create and Market Your Book. All the top marketing and publishing gurus will be presenting hands-on workshops over the three days. For an investment of a few hundred dollars, the Village will deliver a variety of strategies and techniques for all types of books—the emphasis is marketing, marketing, and marketing. If you want to be seriously successful, you will be there. Dive down, drill deep, you will learn strategies and techniques to market your books, expand spin-off products, present all with style panache. You cannot afford to miss John Kremer, Brian Jud, Steve Harrison, Judith Briles, Georgia McCabe, Marty Dickinson, Janita Cooper, Dan Pacheco, Daniel Hall, Mary Barnett, Nick Zelinger and Florrie Binford Kichler. Block the dates on your calendar for 2 ½ days that will turn you and your book into a success. There is a bonus John Kremer dinner workshop (author of 1001 Ways to Market Your Books) on Thursday, the 3rd. Warning: only a few spots remain. Rates increase on Sunday morning, April 1st. As a subscriber to this newsletter, you save an extra $50 when you use the promo coupon: AUEJoel. The success of your book is up to you. If you want it, commit to it. Implement it. Rejoice in it. Market it. Time: May 3 starts at 4:30pm. May 5 ends at 5:00pm. Cost: Now—Author U members: $317 plus $60 for Kremer event. Non-members: $380 plus $75 for Kremer event. After April 1st— Author U members: $347 plus $77 for Kremer event. Non-members: $477 plus $97 for Kremer event. Photo by rghrous. This is an affiliate offer. Thanks Edward…. this is the last weekend for the Early Bird Discount–would love to see you in Colorado! Thanks, authors just can’t learn enough about the need and how to of marketing. It is a whole new game once the book is finished and you realize that you are the one that has to sell it. Good luck. Edward Smith. As Joel said … John is worth the price the price of the entire Extravaganza! I can’t wait for this conference for everything I hope to learn from the other speakers. And, of course, what I’ll learn from giving my own 4.5 hour event the evening before. Thanks Matt–come on over to the Mile High City–Colorado is glorious in May! And you are so right … one of my clients was shocked–shocked … when I told him I wouldn’t work with him unless he committed as much time to his book as I would in getting the baby birthed. Why, why would anyone want to put so much heart and soul into something and not want it to succeed? You do right, it’s a new world we live in and people need to learn to market what they do. It’s not easy any more, everyone is bombarded by adverts every single day. We need to be clever to get through the noise, and things are no different for authors. Denver in May? Sounds good to me, sign me up! It’s got a human life to it and so much depth. It’s a relationship with people, an understanding of process, a strategic look down the road. I love marketing, but it’s hard work. You need a plan and then you need to go and actually do things. Great article. Pity the event is a bit far for me. Any chance of a couple of posts after the event summarising some of the useful stuff? (although I’m sure it will all be useful). Totally agree with Judith’s premise that one has to work at marketing. I self published my first book a year ago and emarketing has been a steep learning curve for me. The best thing I have learnt about emarketing is that mostly it is free, the main cost is blood, sweat, tears and time. It could be interesting to hear the best thing others have learnt about emarketing. That’s a great idea, Christopher, I wonder if any of the attendees would like to write up the event for my blog?